I know! I'm on a Sarina Bowen binge at the moment, because I love each set of characters that she introduces! Lianne and DJ went through some difficult moments, but were amazing once they got together! After meeting Lianne in The Shameless Hour, I jumped into The Fifteenth Minute immediately! I fell in love with her, so I needed to get her story as soon as I could. She became such a great friend for Bella, and I could see chemistry blossoming between Lianne and DJ. Lianne has had a sheltered life for a person who may've grown up in the spotlight. She was trying to lead a normal life by going to college and expanding her career but it was hard for her to fit in. She found some normalcy with her friend Bella but she enjoyed her time with DJ the most, when he wasn't avoiding her. DJ had feelings for Lianne, but he had complications that made his life hard. He was fighting to remain in college and his family made things difficult for him too. He enjoyed his DJ job for the ice hockey and spending time with Lianne brightened his day. I am continuing to love The Ivy Years series, and the complex characters that Sarina Bowen introduces in each book. Each story has been unique and leaves you wanting more. 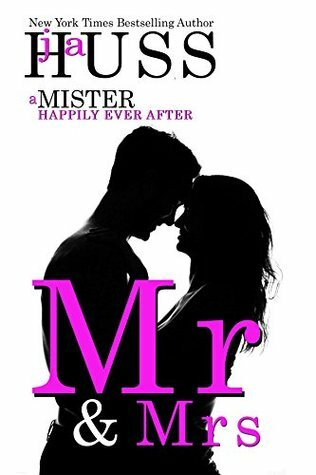 I enjoyed DJ and Lianne's story, it was sweet and intense despite her high profile. DJ helped Lianne with her lines, and Lianne gave DJ some faith that he could pull through his difficult time. I am looking forward to more stories form this world... or anything that Bowen produces! OMG! These two were so perfect together! They had their tough times, but this here shows they deserve one another! I sweep the pad of my thumb across her perfect cheekbone. Then she leans into my hand. It’s slight—almost imperceptible. But it’s there. A sign. It’s a short journey to her mouth, but I say a little prayer along the way. Please. On the first pass I’m still cautious. I take just a brush of her soft lips, landing on her jaw. She smells of berries, I think. Something sweet. I pause there, pressing a kiss to her skin, and she shivers. Then instinct kicks in. I slip my fingers to the nape of her neck and pull her closer to me. The warmth of her small body finds mine, and I have to kiss her. I turn my head a few degrees and find her soft mouth with my hungry one. The noise she makes is a whimper. I kiss it away. Catching her chin in one hand, I tilt her face up to mine. She looks…embarrassed. But I don’t see why that should be. I kiss her perfect forehead, her sweet scent enveloping me once again. “Sure glad I came out for pizza tonight,” I whisper. read more "The Fifteenth Minute by Sarina Bowen ~ Audio book Review & Quote-tastic (@SarinaBowen)"
I decided that it was time to give the Bad Habit series a go! You know how much I enjoy reading about tough rockers! It was also about time I tried J.T. Geissinger, and I hope to read more of her work in the future. J.T. Geissinger is an author I've seen around for a while, and when I was browsing for my next audible read, I snapped this one up on sale! Who doesn't love a famous lead singer falling for an unsuspecting make up artist... who also happened to land the female lead in their next music video! I loved Kat and how true she was. She stood up for a girl who was under the weather, even though she didn't know her. I liked that she was that kind of strong, confident woman. She caught Nico's eye and tried to keep him at arms length, but Nico was a persistent fella! I was hoping to really enjoy this one, but unfortunately it fell a little flat for me. Nico seemed a little too much alpha male and over protective, not wanting Kat to make any decisions for herself. Kat made stupid decisions at times when she should've listened. It was like they couldn't get on the same page at the same time. I'm also wondering if the narration was one of the reason's I couldn't connect to these characters and I think I should've read the book instead! I do hope that I try her work again in the future though. I thought this moment was really sweet, where Nico told Kat how much she meant to him. My lips parted. A funny little noise escaped my mouth. The edges of everything grew fuzzy, because of the water welling in my eyes. “I’m not going to ruin you,” I promised in a vehement whisper. I felt the kiss he gave me all the way to my toes. It was hungry—no, it was devouring. I clung to him, feeling what little reason I had left regarding this relationship slipping away. read more "Sweet as Sin by J.T. 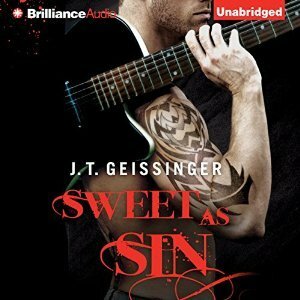 Geissinger ~ Audio book Review & Swoon Thursday (@JTGeissinger)"
I'm a day late with my review, because you know, LIFE! Anyway, here it is! This was such a fun read, but it had a touch of seriousness too! And I know I will always enjoy a Sarina Bowen read! What a bubbly pocket of fun Brynn turned out to be! 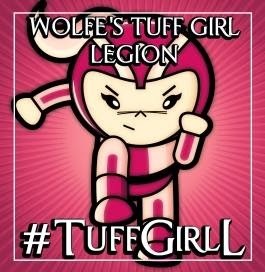 I do love a girl who's voluptuous, because really, none of us are perfect! And this girl, she won the heart of a fantastic guy... he'd been hurt and wasn't looking for anyone, but Brynn flew into his arms and he just couldn't let her go! Brynn was on the rebound, but because of a few good friends, she was encouraged to get back into the game. When she saw her ex, she downed some liquid courage and was sent on a mission to fix her night. Brynn found herself in the arms of Tom, and he gave her the best sexual experience of her life! Tom and Brynn were great together, even though it wasn't smooth sailing for them. Crap hit the fan and Tom was there to support Brynn, and even had a plan to put her life back on track once again. However the more time they spent together, I knew they were meant to be. I really did enjoy Man Hands, but there was a thread left open that I would've liked to see closed. I adored Brynn and Tom's relationship, and was glad to see them work through their intense feelings for one another. The epilogue was hilarious... mind you with the love she had for that pantry, I would've been annoyed (I would want to do that first! ;) ). I am looking forward to visiting this world again! I loved the relationship between Tom and Brynn. Tom was the sweetest guy! I may have been invisible to my ex, but this man, this man right here, he sees me. His big brown eyes soften. “You’re the treasure here.” He leans over and kisses my forehead. 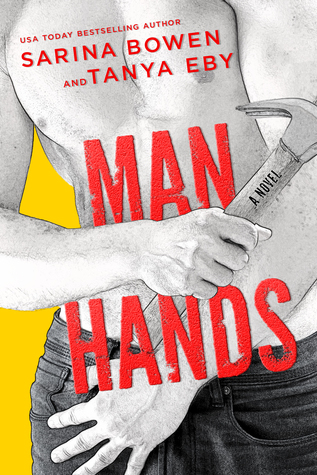 read more "Man Hands by Sarina Bowen and Tanya Eby ~ Review & Quote-tastic (@SarinaBowen, @Blunder_Woman)"
Ahhh... Colleen Hoover! 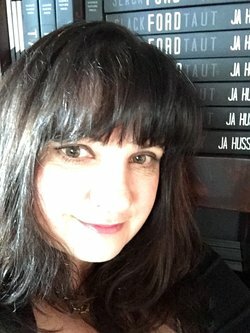 This author knows how to such you into her incredible worlds and she makes you fall in love with all the characters, regardless of how broken they may be! 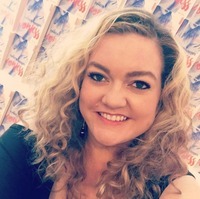 Colleen Hoover sure knows how to take one twisted family and turn it into a beautiful, heart wrenching story! I've read a few of Colleen's books now, and I really wasn't sure what to expect going into this one, but it turned out to be just as amazing as the rest of her work! Merit was a girl who was a bit misunderstood. She came across as brash and mean, but the more I learned about her and a few of her secrets, the better it was to understand her. It was easier for her to withdraw from her twisted family, so she could avoid all conflict. But seeing Merit getting to know her family again really opened her eyes, as well as mine, to see that there was more to her family than what she perceived. I enjoyed seeing Merit with Sagan. He brought a spark back into her dull life. It was interesting to see him express himself through his drawings, which was one of Merit's favourite things about him. He also helped her see her family in a whole new light after her little incident. The whole Voss family had it's quirks, and they didn't gel like a family should. They each had a secret of issue that kept them apart. When these secrets are in the open all hell breaks loose, as the family is then forced to deal with one another. Hoover touched on a delicate issue that those who have it, don't realise they are suffering. There were some sad moments, but there were some moments that happened toward the end that had me laughing out loud. 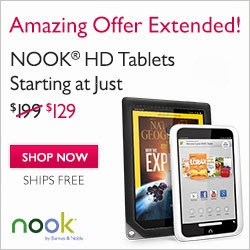 There were some awkward events and some tender scenes that had me swooning as well. Altogether, it was an incredible read, that touched my soul and I'll be thinking about it for a long time to come! 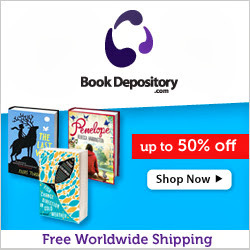 Complimentary copy provided by Simon & Schuster Australia, via NetGalley in exchange for an honest review. Today I have two swoons, one sweet kiss and the other is a beautiful moment between a father and daughter that made my chest ache! I have no idea what those words mean, but I like them. And I like how his lips connect softly with mine right after he finishes saying whatever it was he just said. And I was right. It’s perfect. So perfect, it feels like the old days in the movies when the male lead would press his hand against the woman’s back and she would curve her body backward against the pressure of his kiss like the letter C while he pulls her against him. It’s just like that. He’s pulling me to him when his tongue slides across my lips. And just like in the movies, my arms are dangling at my sides until I realize how much I want to be in this with him and finally begin to kiss him back. I pull my hands from my pockets and return the hug. My father presses his cheek to the top of my head and I can’t help but smile because it’s probably the best hug I’ve ever been given. It’s the one hug I’ve needed the most. We stay like this for a while, almost as if he’s making up for lost time. And maybe I am, too. 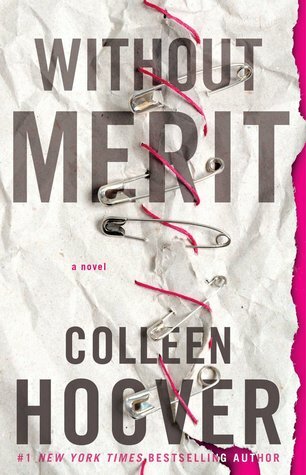 read more "Without Merit by Colleen Hoover ~ Review & Swoon Thursday (@colleenhoover, @SimonSchusterAU)"
read more "Mr. & Mrs. by J.A. Huss ~ Review & Quote-tastic (@jahuss)"